Denim clothes will last longer if you wash them less frequently. Denim might be durable enough to handle just about any task you tackle, but it still requires a bit of care to keep it looking its best. Wash jeans less frequently than other clothing items, and wash them inside out to preserve their classic looks for as long as possible. Avoiding the dryer all together also helps keep those jeans in their best shape, especially when dealing with distressed denim or jeans that are already a tad too tight. Denim jeans, jackets and even shirts or skirts in a deep indigo shade may bleed a bit when washed the first few times. If you wish to keep your dark denim looking like the midnight sky, wash it inside out. This is true even as the denim ages and fades. 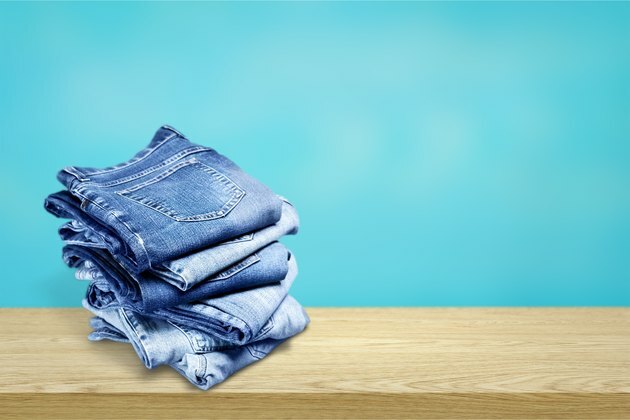 In many cases, the inside of denim clothing is what gets the dirtiest, collecting sweat and body oils, so turning it inside out helps wash away the odors and oils. Feel free to toss older, faded denim in the laundry with your new dark jeans, or to wash those new jeans with other dark apparel. The rumors are true: Denim doesn't need to be washed after each time you wear it. 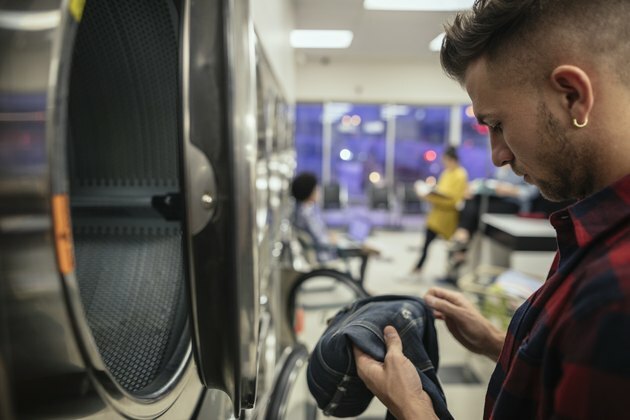 You can wait five or six wearings before washing jeans, so long as they aren't stained, dirty or reeking of food or sweat odors picked up along the way. Even though most denim materials are machine-washable, check that care tag to make sure your favorite don't have an unusual fabric blend that requires hand washing, dry cleaning or other special care. Wash jeans according to the care instructions. Otherwise, select a gentle setting with a cold-water wash and rinse, and use a bleach-free laundry detergent—ideally one designed for dark colors. Close all buttons, snaps and zippers. Do not use fabric softener, as the chemicals tend to trap in odors and grime, preventing the fabric from getting thoroughly cleaned in the future. Machine-dry the jeans if you aren't concerned about shrinkage or added wear. Otherwise, hang-dry them or dry them for a few minutes by machine on medium heat, then hang-dry them the rest of the way. Hand-washing is the gentlest way to handle denim. Even if those jeans can be tossed in the machine, hand-washing offers the chance to treat them with gentler care. This works especially well for distressed denim or thin fabric that could warp or wear in a machine. Fill a washtub with cold water and a small amount of a detergent designed for dark delicates, using the amount recommended on the detergent bottle. Soak the jeans for 15 to 30 minutes, swishing the material around from time to time to help loosen debris. Drain or dump the water, then rinse the denim thoroughly. Roll the jeans up over the sink to release excess water, or roll them in a lint-free cotton cloth to absorb moisture. Immediately unroll the denim and shake it out, then hang it to dry. 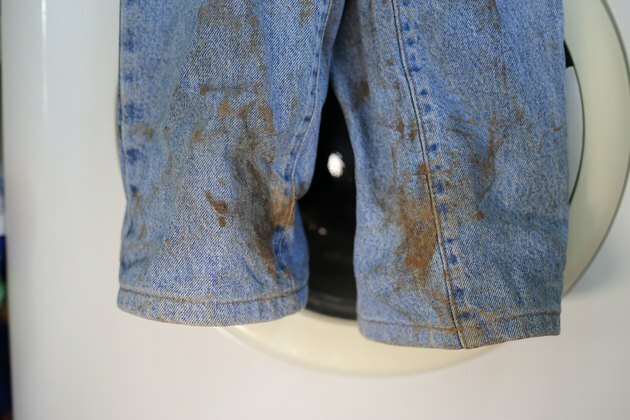 Stains happen, no matter how careful you are while wearing that denim. Removing stains, in many cases, is simply a matter of pre-treating the spot before washing the denim. Gently scrape away any residue such as grass or food, then wet the stained area. Apply a pre-washing stain remover designed for dark clothing, or use a dab of non-bleach laundry detergent. Massage the spot, doing your best to work from the outside edges of the stain towards the middle to avoid spreading it. Treat oily, greasy spots by blotting them with a white cloth or paper towel, not with water. Blot up as much oil as possible, then apply baking soda or baby powder—any type of non-staining powder that could help absorb the oil. Afterwards, apply a dab of laundry soap and wash as usual. Food stains can be treated with club soda or tonic water in a pinch. A dab of dish soap and water, if handy, can also help in a pinch. Treat a blood stain with a small amount of hydrogen peroxide. Test the peroxide in an inconspicuous area first if concerned about it affecting the denim color. Peroxide lifts the blood from the fabric. Rinse after a few minutes, then apply more peroxide as needed. Always rinse the peroxide out to ensure it doesn't affect the fabric. For ink stains, pour a little vinegar onto the ink stain, followed by a sprinkle of cornstarch. Scrub the spot, working from the outside in, to loosen the ink from the fabric. Rinse and treat again, if necessary. Rubbing alcohol also helps loosen ink from denim.